Here’s a cute French toast recipe that’s ideal for serving at a weekend brunch. 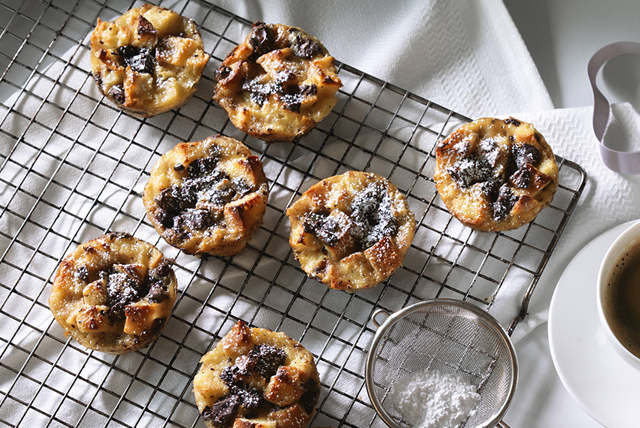 Your family is sure to love this Chocolate-French Toast Cups recipe! Beat pudding mix and milk in large bowl with whisk 2 min. Stir in eggs, then bread. Let stand 5 min. Stir in chocolate. Bake 25 to 28 min. or until toothpick inserted in centres comes out clean. Cool in pan 5 min. Run knife around edges of cups to loosen from pan; remove from pan. Sprinkle with sugar. Serve with a fresh fruit salad and cup of hot brewed coffee. These portion-controlled French toast cups can be prepped ahead of time. Refrigerate up to 24 hours before baking as directed.